Margaret A. “Peg” Powell died peacefully in her sleep on Friday March 22, 2019 at her home in Wheatland, Wisconsin. Throughout her lifetime, Peg was in the Women’s Army Corps, studied nursing and became an LPN, and was an advocate for the rights of women, patients, and animals. After the death of her beloved mother in 1959, Peg and her domestic partner raised her younger sister Connie Dawn, who had been born during Peg’s senior year in high school. In the late 1960’s, Peg became the mother of Kimberly and Stephen. She adored being a mom and was always grateful for the love and meaning that her children brought into her life. Peg’s life followed a number of paths. 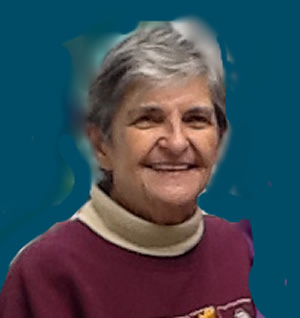 Peg attended public schools in Lansing, Michigan and graduated in 1950. After high school, Peg enlisted and served in the Women’s Army Corps as a Military Police Officer during the Korean War. She was proud of her military service, but also participated in protests against unjust wars. After the service, Peg moved around the country, eventually landing in the New Jersey/Pennsylvania/New York City area, where she worked in data management and office administration. In the 1970s, Peg and her children moved back to her birthplace, Lansing. MI. There, she studied nursing and became an LPN. Because of her kind and compassionate nature, Peg was upset by the treatment of the dying that she witnessed in the hospital setting and became active in the early stages of the hospice movement. She was devoted to her patients and loved the hands-on care that she was able to provide through hospice. In 1986, she met her domestic partner Mary Kay Schleiter, and on February 1, 1987, they made a commitment to spend their lives together. In 1989, they moved their family to Kenosha County. Peg continued in hospice until a back injury made that career impossible, and she eventually started her own business, “Tender Loving Pet Care,” where she specialized in caring for animals with medical conditions. Peg was an animal lover and her home was often graced with the cats given to her by her hospice patients. She loved to be in nature and spent many hours watching the birds and woodland creatures outside her window. Peg was a trailblazer in the area of gay rights and she was one of the original participants in the iconic Michigan Womyn’s Music Festival, which she attended almost every year for 40 years. Peg was generous, compassionate, and joyful. She had a positive influence on the hundreds of people who were touched by her gentle soul. Peg is survived by her beloved partner Mary Kay Schleiter of Wheatland and by her children Kimberly (Doug) Cottingham and Stephen Powell, as well as her grandchildren John and Jason Cottingham. Peg was born on June 27, 1933 in Lansing Michigan. She was one of four children born to Allen and Pauline (Stevens) Crawford. Peg was preceded in death by her parents, her brothers Allen “Junior” and Bob, and by her sister Connie. Peg’s family would like to thank the caregivers and friends who cared so lovingly for Peg, especially Janet Herlo, Adrianne Starks, Connie Russell, Gabrielle Zapp and Laura Hathcoat. A memorial service with full military honors will be held for Peg on Saturday April 6, 2019 at 2:00 p.m. at Bradford Community Church Unitarian Universalist (5810 8th Avenue, Kenosha). In lieu of flowers, memorials to Safe Harbor Humane Society, Women’s and Children’s Horizons, or Bradford Church would be appreciated. I am so sorry to hear this. I remember her from my days in Wisconsin; she was such a kind soul and bright light. Mary Kay, my heart goes out to you. Please do promise to take care of yourself during this challenging time. I had hoped to meet Peg and reconnect with you, but I still will hope for the latter. Peg sounds like a talented, caring, intelligent and strong woman, and I am glad to have had the pleasure of reading a little bit about her life! Blessings, MK. My love zooms across the miles to you! So very sorry to hear of your loss Mary Kay. Peg was a very kind and compassionate soul and she surely gave much service to relieve the suffering of others, not only in her service as a nurse, but in showing loving kindness to family, friends and and all others whose paths she crossed, throughout her life. May her kind deeds be long remembered and may she rest in peace. So sorry for your loss. Sending warm waves of comfort your way Mary Kay. So so sorry to hear this. Though I don’t believe I ever met her, you resonated each other’s lives so well, that I feel as though I had. It was a lovely tribute to her in this obituary. You two have journeyed far and long together, and I am sure you will find fitting ways to continue to honor her memory. I cannot make the memorial service, but if there is a charitable cause you have selected please let us know. My condolences to the family of Peg Powell. She was an amazing woman and I will never forget the time we spent together as she was truly a gentle soul who would not even harm a bee. Her service in the military and early women’s movement, as well as her commitment to serving those most in need were an inspiration to many. I was lucky to have known Peg, and even though we haven’t spoken for several years, I think of her often.